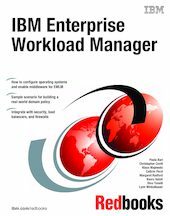 This IBM Redbooks publication provides an introduction to the Enterprise Workload Manager (EWLM). In addition to describing the overall product concept and functionality, it presents a detailed discussion of the elements that are part of the solution. Step-by-step instructions take you through the installation of EWLM code on multiple platforms, for both the domain manager and managed servers, and also show how to enable the instrumentation of the middleware for a 3-tier Web application. The features for administering EWLM are described, along with the monitoring and reporting capabilities. A sample scenario implemented in the ITSO environment is used to guide you through the process of classifying workload, and defining and deploying your own EWLM policy. This scenario is then used to demonstrate techniques for securing your implementation. The load balancing capabilities of EWLM are described. Troubleshooting hints and tips are provided, along with some basic performance considerations to help you design the optimum EWLM solution.